Jorge Tzib, 27, of the Shawville area, San Ignacio Town, was found dead on the road on Joseph Andrews Drive between the Red Cross Building and the Gurus Building in San Ignacio, about 1:55 this morning, Monday. There were multiple stab wounds on his body and his throat had been cut. Tzib’s body was taken to the Karl Heusner Memorial Hospital to undergo a post-mortem to certify the cause of his death. Police say that they found Tzib lying face-down on Joseph Andrews Drive with a knapsack on his back. Their initial investigation revealed that Tzib was walking in the area when he was attacked and stabbed, and his throat slashed. Someone driving in the area saw the body on the road and called police. Tzib’s mother said that she was at home when police called her and told her that her son was dead. The grieving mother told Amandala that she and the family are devastated. Her son had no known enemies, she said, and so they were not expecting such a tragedy. She said that she wants the killer to be found and dealt with to the fullest extent of the law. 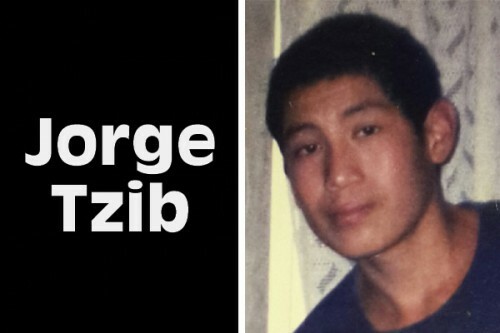 Jorge Tzib is survived by his mother, 5 brothers and 6 sisters. He is also survived by numerous relatives and friends. Police have detained a man who they believe can assist them with their investigation into the murder.